Associated Press Rep. Jim Banks, R-3rd, wants President Donald Trump to nominate Amy Coney Barrett to the Supreme Court. It would take Hoosiers 451 hours – or more than 11 weeks – to read the entire Indiana Administrative Code, according to the Mercatus Center at George Mason University, which analyzes and quantifies state regulatory text. Indiana has two-thirds fewer state regulations than neighboring Illinois, though. Author James Broughel noted the 2018 Administrative Code contains 91,998 restrictions and 8.1 million words. People and businesses in Indiana must navigate these layers of restrictions to remain in compliance. By comparison, there are more than 1.08 million additional restrictions in the federal code. Researchers at the Mercatus Center at George Mason University developed State RegData, a platform for analyzing and quantifying state regulatory text. State RegData captures information in minutes that would take hours, weeks, or even years to obtain by reading and counting. For example, the tool allows researchers to identify the industries that state regulation targets most by connecting text relevant to those industries with restrictive word counts. Referred to as regulatory restrictions, the words and phrases shall, must, may not, prohibited, and required can signify legal constraints and obligations. The three industries with the highest estimates of industry-relevant restrictions in the 2018 Indiana Administrative Code are animal production and aquaculture, ambulatory health care services, and utilities. Barrett, a judge on the 7th Circuit Court of Appeals and a former University of Notre Dame law professor, is reportedly on the short list Trump is considering to replace retiring Supreme Court Justice Anthony Kennedy. Trump met separately Monday with four candidates, including Barrett, 46, according to news media. 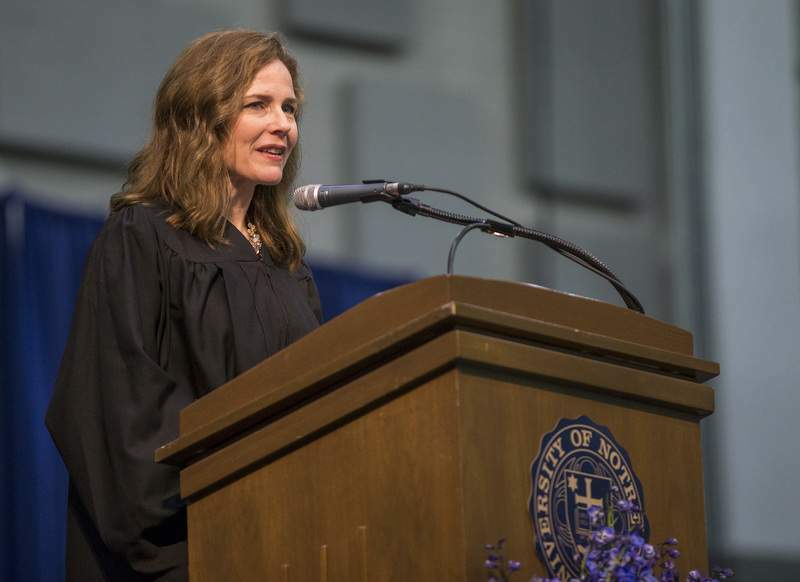 “Amy Coney Barrett would bring both impeccable credentials and Hoosier common-sense to the bench. As the youngest jurist on President Trump's short list, she has the unique opportunity to leave a legacy and reshape the direction of the court for generations to come,” Banks, R-3rd, said in a statement. Barrett wrote in 2013 that Supreme Court justices should rule according to the U.S. Constitution rather than judicial precedents, leading many to presume she would support repealing the 1973 Roe v. Wade decision legalizing abortion. If a blue wave of Democratic victories is coming in U.S. House elections this fall, as many political analysts have been forecasting, Indiana is seen as keeping a good distance from the beach. Nonpartisan assessments of Hoosier congressional races show Republican incumbents remain heavily favored in their five contests, that Republican candidates are considered safe bets in two open-seat districts, and two Democratic incumbents are regarded as shoo-ins. The Cook Political Report on Friday rated only one Indiana seat as being somewhat in play: the South Bend-area 2nd District, where three-term GOP Rep. Jackie Walorski is being challenged by Democrat Mel Hall. Cook has regarded the district as “likely” Republican since early in the year. More-competitive races are considered those that “lean” to a candidate, and the closest contests are called toss-ups. Walorski also is rated as “likely” to defeat Hall in the June 14 ratings from Nathan Gonzales' Inside Elections. But Gonzales adds a cushion to his layers: Between “lean” and “toss-up” is a “tilt” category. Larry Sabato's Crystal Ball assigned a “safe” label to all Hoosier incumbents and the Republican candidates in the open 4th and 6th districts in the June 28 ratings by the University of Virginia political science professor. Gonzales has only 11 of the nation's 435 House districts as toss-ups, compared with 25 for Sabato and 34 for Cook. Republicans currently have 42 more House seats than Democrats do.